Alcoholism treatment can be as short as three days, or as long as two years, depending on the facility. Most major insurance companies, Medicare and Medicaid, will pay for a thirty-day treatment at an alcohol treatment and rehabilitation center, with an option to extend the treatment a specific number of times within a five-year period. If someone is self-pay, they can stay as long as they have funds. Obviously, the longer the individual is in a restricted environment the more likely they will learn the behaviors and skills to prevent relapse when discharged. Depending on the patient or the facility, there is a wide variety of programs that can be offered. However, detoxification, counseling, instruction, and therapy, when enrolled in a thirty-day program, usually works along this schedule. How long does alcoholism treatment last for? 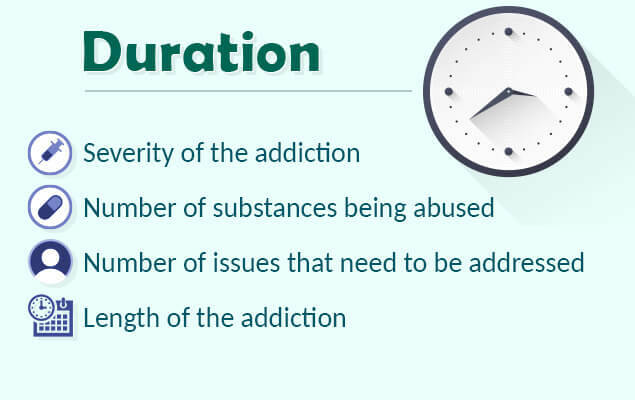 Treatment for alcoholism can be accomplished within three days, or can last as long for as two years. A person can stay inside the treatment facility as long as he or she can afford it. Some insurance companies will cover the payment for the treatment for only a certain number of days. Some patients worry how to go to rehab and keep a job, as the treatment might be lengthy. However, the US government provides some ways and options how to secure a job while treatment. What happens during the first week of alcoholism treatment? During the first week of alcoholism treatment, the detoxification process occurs. The therapists, counselors, and doctors also will also start creating treatment plants and initiate therapies along with prescribed medications. Treatment timeline can slightly different for different inpatient or outpatient facilities, however, they have much in common. Within 24 hours of admission, the patient will be evaluated by a doctor, a psychologist, and possibly an addiction specialist. A medically supervised detoxification will begin and be allotted three days in the schedule. This is the minimum time required to rid the body of the toxins of alcohol. During the three days, the patient will be medicated and closely observed to prevent death from the withdrawal symptoms. The patient will work with each therapist and counselor to write a comprehensive treatment plan that outlines the circumstances leading to the admission, the behaviors, the psychiatric problems, the medical problems and the social problems that have developed because of the alcoholism. A discharge plan is begun that outlines the specific steps to be completed by the patient in order to be discharged. The patient and the patient’s family will meet in a group situation and one-on-one with counselors, therapists, doctors and nurses to discuss each aspect of rehabilitation. The patient will self-disclose the problems in each setting that led to the addictive behaviors. Each therapy session will move the patient closer to sobriety and independent living. Many alcoholics have medical issues and mental health issues because of the long-term consequences of alcohol abuse. A doctor will prescribe medicines to help with the physical problems and a psychiatrist will initiate depression or anxiety medications if there is a dual diagnosis of addiction and mental illness. The medications are leveled out and the patient becomes functional and socially aware. More intensive family therapy occurs, along with more hints for sober living, possibly occupational therapy, and life skills instructions. There will be more support group meetings and interactions. The rehab staff will begin to transition the patient to move into readiness for discharge. By the end of this week, the patient will have a good understanding of the underlying behaviors that led to the addiction. The patient will know specifically the medical issues that need to be addressed with a family physician. The family system will know the expectations of a healthy relationship or dynamic and will have worked closely with a therapist in private to address the most pressing issues. The individual will be guiding the therapist and initiating the topics during personal counseling. The family unit will be working on conflict resolution and engaging in positive reinforcement within the family group. The immediate health issues have been addressed, the patient no longer has withdrawal symptoms, and the patient has learned the need for follow-up care. The patient has learned how to take care of their person, nutritional needs, hygiene, social groups, exercise, and home care. This week is all about going home safely and sober. The individual has claimed responsibility for the behaviors that led to addiction. The individual, with the addiction counselor, makes appointments for the doctor, the psychologist, a therapy session and finds a support group. The family has agreed to continued therapy in a different place for a specific length of time. The patient will have a trial visit with the family, possibly for a weekend stay. Upon returning, the counseling and therapy sessions will focus on integration back into society, including new people, places and things to remove the previous triggers for drinking. The client will make a plan for meeting new sober people, frequent a different place for recreation and relaxation, and will have asked a trusted friend to remove all traces of alcohol from their home. What happens after alcoholism treatment? The clients will be healthier after completing all the necessary steps of the treatment process. The focus of the individuals is to stay away from alcohol. They can choose to join support groups, religious groups, or have individual therapy session to maintain a sober life and rebuild relationships after rehab. The client will have completed all of the steps for social integration. They will be healthier, stronger and happier than any time in their recent history. Each day will bring a new development that will try the social skills, reasoning and emotions of the client. The focus for the individual is to stay away from alcohol. It is now up to the individual to choose what actions will best support that decision. Some people choose AA, others pick an individual therapist, and others join social organizations or religious groups. Graduating from rehab is the first step to a changed life. Alcohol rehab cost might seem too high, however, your health values higher.